Right about 11 months, Ewan learned how to point. If I ask him ‘where’s Mio?’ he’ll point at Mio. Doesn’t work if I ask ‘where’s George?’ But at dinner he pointed at the food he wants. He’s also learned how to say ‘all done’ with sign language. He uses it frequently not only at the end of meals, but when we put him in his car seat, and when we try to change his diaper. At the grocery store, he was clearly calling Celia whenever she strayed too far away from the cart. Scolding her perhaps? poor girl’s got everyone on her case. He also goes and bangs on the bathroom door when Josie is in there and says a two syllable word (Josie gets distracted sometimes and overstays her turn), as I am prone to doing occasionally. We hear lots of ma ma ma ma still. He also understands the following words ‘nurse, milk, out, up, dance, share, guitar, ball, cat, kiss, hug, besito.’ We hear mama all day long, it seems to mean many things from ‘pick me up’ to ‘look at that’ to ‘I’m upset’ to ‘someone else screamed mama and so can I’ and more. 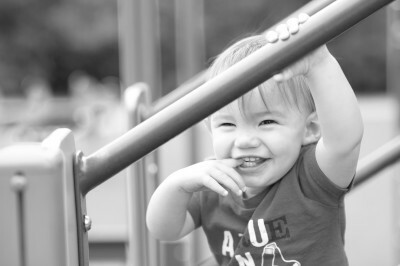 He is generally a very happy little boy so long as he’s not tired or hurt. He loves to chase after her sisters, and will play by himself too around them. He will not be left behind. He’s also convinced that once he knows how something works he insists that he gets to do it. Such as holding my credit card whenever he see’s it come out, brushing his hair, or stepping on the scale. He makes a big noise that signifies ‘stand back everyone! I’ve got this!’ and makes his grab. 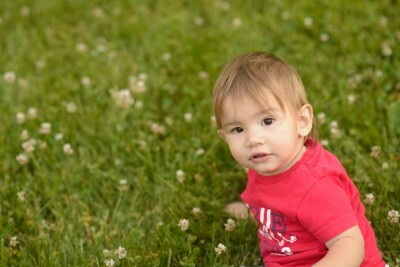 He’s getting to be so much more of a little boy, and less like a baby. Ewan is not a very adventurous eater. He generally rejects anything new and won’t try most things. If I ever try to put something in his mouth it is automatically spit out. He insists on self feeding everything, so things like yogurt we aren’t getting far with these days. I’m super excited for him to be a year old when I open the flood gates for new ‘more-allergenic’ foods like milk, egg whites and everything else but nuts. He mostly wants to eat a set diet each day of oat cereal for breakfast, pasta for lunch, and beans for dinner. We can get some carrots, broccoli, peas, carrots and cheese into him if he’s in the mood. Sometimes he just about rejects the meal entirely and prefers to nurse instead. He loves to head outside and is very excited every time I put on his shoes as he knows we’re headed out. He also loves to be carried and snuggle. He gives wonderful kisses and blows them to us! 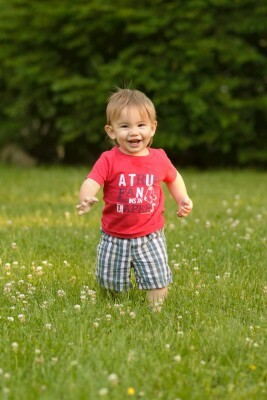 He also has learned how to dribble a ball as in soccer, he follows it and keeps kicking it. Another one of his favorite activities is dancing. He see’s me turn on the music and he starts dancing before the music even starts. Then he goes over and touches the corner of the TV as if it’s an ipad and he’s controlling it himself before dancing some more. If he’s in a good mood he’ll often dance when daddy gets home at night too. He’s pretty shy around strangers but he’ll come around after a few minutes of getting to interact and watch them. We had been fighting this bad rash for many months but we’ve finally cleared that up and returned back to cloth diapers which makes us all much happier. Getting so close to a whole year old now! New game: soccer – he follows and kicks the ball! The world keeps spinning and Josie makes her sixth trip around the sun! And what a trip my lovely first-born child has become. She continues to have lots of opinion on how things are going in her world, lots of thoughts about them and how she wants them to go. She is a non-stop talker ready to engage with her world all around her. 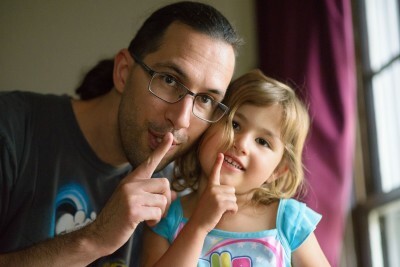 We’ve had a busy spring with her staying at home for the rest of her kindergarten year. She’s been working hard and learning many things about the world around her. She’s been interested in cooking, the planets, the amazon, penguins, the arctic and butterflies for some examples. We do art projects with those ideas, science experiments and all the field trips we can make applicable. We read many many books each week and Josie has become a voracious reader herself. Her favorites right now have been the Ramona series that we all know from our childhood and she’s also been a huge fan of listening to the Penderwicks series which is more recently written. She also reads Celia many books and even works to teach Celia her letter sounds plus math skills. She reads everything written on signs everywhere we go, so we have fun explaining things like ‘dead ends’ and ‘blind drives’ and why ‘rockland trust’ isn’t a rock climbing gym, but a bank. Some weeks she was not so fond of a subject we were working on, but then often a few weeks later that would be all she wanted to do, like math. Some weeks she was excited, others she was not. So I try to adjust to her likes and ideas while still covering all the important skills. She’s adding multidigit numbers, subtracting them as well and even doing some small multiplication problems even if she doesn’t know it yet. She did a great project on plans this spring as well documenting a plants growth over a week and graphing it. Josie likes to spend her days playing pretend games with Celia, reading, playing with other friends, hanging out at the park and generally making a mess whenever possible. She likes to sing and dance and make her own plans. She just finished up two sessions of swimming lessons and is down to only using one bubble in swim class. Her teacher says once she can drop the bubble she can move up to another level. Hopefully by the end of summer she’ll be ready! She’s gotten so much braver and stronger in the water from all her hard work. 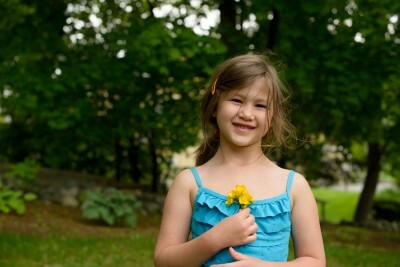 Another activity that she loved this spring was a six week program at a local farm for homeschoolers. She learned about the different animals and how the farm works. She helped to plant, harvest and take care of the animals. We even got eggs from the farm and some of our plants. She’d love to do it again in the fall if it ends up working out. Josie continues to love to do art, painting is a favorite as well as drawing and we’ve even made some sculptures from wood and recyclables. She’s a slow riser in the morning, she needs some time to get up to speed like her dad. She likes to read in bed for a while before getting up, and we all appreciate her getting that time to center herself ready for the day. Wouldn’t trade her for anything in the world and she’s a great big sister, helping Ewan, teaching Celia and holding doors for me while I carry all the stuff! While I’m laying in bed helping my kids to get to sleep I think about things, like how I don’t want to fold and put away all the laundry that is always amassing. I don’t mind washing and drying it, it’s the folding and putting away that is the hardest part. And I even make my kids put away their own clothes, except Ewan of course, he tends to be better at emptying drawers than filling them. I also gave up sometime after Josie was born with sorting clothes before washing them. So far no mythical laundry police have come to arrest me for not doing that. Sometimes if there’s a big enough pile I try to just put sheets and towels in together. But why? Plus I consider, why should I fold it all, it’s just going to be worn again? The girls unfold the laundry as they put it away, even if they do help me fold it sometimes. If I’m lucky my mom will always pick up a basket or two when she comes over to fold, but maybe I should just make a big pile and we can just put the clean clothes in it. We all wear easy-care clothes anyway, nothing really wrinkles too much and I could put those away special. I could get valuable time back in my day. I can just imagine the pile, I’d put it at the end of Ewan’s bed so that when he falls off the bed (which has really only happened once so far) he’ll hit something soft. Things that remain in our drawers really should just be given away because we don’t wear them regularly. What a good way of finding our excess clothing! But alas, the problem is the feline population of our house. They too would love to climb and sleep on mount laundry. Anywhere they sleep unfortunately will at least have cat fur, and then every few days it would end up as Mount vomit when they spew up a hairball. Then I’d have to wash it all again. But at least I wouldn’t have to fold it. I remember one of my best friends in high school’s family made the kids fold all the laundry. I think that will be the forthcoming solution, just as Ewan starts to understand how to fold instead of destroy. Celia has been constantly shifting in her chair all dinner. We keep reminding her that it hurts to fall off and we want her to be safe. So she of course keeps shifting and falls off and we hear ‘I’m ok. I’m super super OK!’ Well then, if she’s super super ok, guess she should keep squirming. I don’t remember why they were supposed to be quiet, but they’re cute anyway. Saturday morning we had a plan! 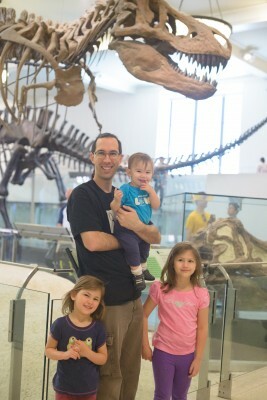 We headed to the American Museum of Natural History. After a long trip on the subway, in which one train didn’t run on the weekends (yet didn’t say that anywhere) and then the train that did run, ran express past our stop only, we did make it. After the trip, we stopped for a smoothie and falafel from the trucks that are ubiquitous everywhere. Good snack for us vegetarians. We got into the museum gratis courtesy of Jordi’s job, and headed right for the dinosaurs. Ewan loved the exhibit, lots of room to run around and move and touch things. He’d had plenty of being trapped and strapped in places the previous day. The girls were fairly impressed, but mostly loved to play with any touch screen exhibit around the place. We spent time with the dinosaurs and then some other prehistoric animals, lunch and then some apes getting closer to humans and the planets. Celia very astutely noticed ‘they almost look like people!’ at the Neanderthals and other not quite homo-sapiens. After the museum, we promised the girls a treat and found that one Magnolia bakery was not too far away. 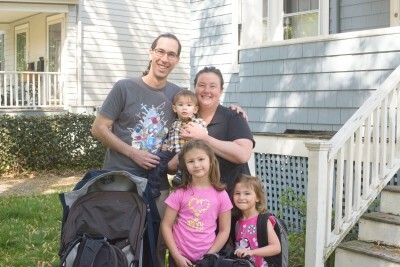 We headed down, Ewan asleep while carried, Celia passing out in the stroller on the way there. 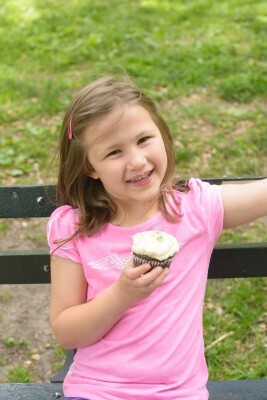 We picked up some cupcakes and cookies and went towards Central Park to nosh down on it all. She was super tickled to get one with this little pink rose. They were delicious, light and fluffy, and sweet. It gave me a good idea of how I was supposed to make my cakes look and taste from their cookbook! 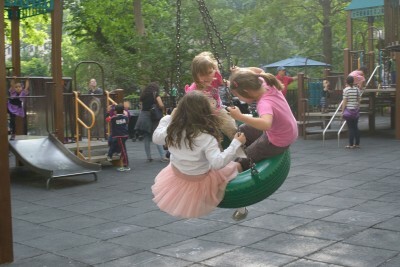 While we were in central park we found a playground to let the kids work off some steam and relax away from cars and sidewalks. 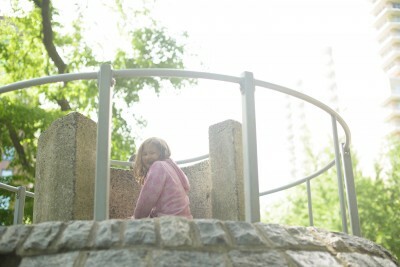 We went to the adventure playground. 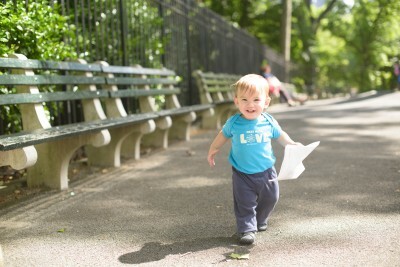 Ewan’s favorite thing was to find every bit of trash and pick it up and play with it. In the museum too, he found every program and map. While we were playing it rained on us a bit, but it passed pretty quickly. While we were sitting there our friend Larry got in touch and came to meet us there. He remembered playing at this same playground as a kid too! Electronic devices predicted that it would rain again, and soon, for a while so we decided to head across the park to the zoo where there would be a bit of coverage and protection from the rain. On our way it was raining. 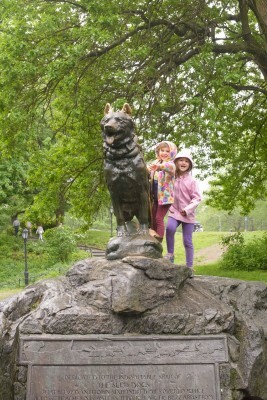 One stop we made per Josie’s request was at the statue of a dog named Balto. This dog delivered medicine to some very sick people in Alaska, and she had read a book about it just the previous week. So they were tickled to see the statue, even if we only hung out for a few seconds in the rain to take a picture. Oddly some other women were taking their picture with the dog too. I’m not sure I see the attraction, for the adults. 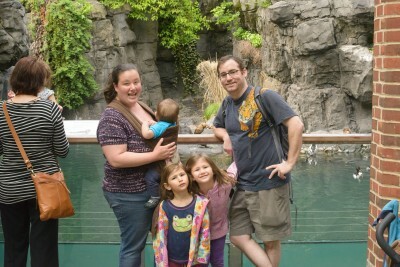 About the time we finally got across the park and to the zoo, it stopped raining. We watched the sea lions, the penguins, some ducks (and some pigeons pretending to be ducks as seen below). We hiked up to the Red panda and Josie regaled Larry with the entire story of Frozen, because he admitted he hadn’t seen the movie. After the zoo, we headed back toward Koreatown with Uber to a restaurant literally a few businesses up from our place, that unfortunately had no high chair. We scrambled for someplace else and came up with yet another nearby restaurant that produced some yummy bi bim bop and tofu soup for us all before we went back to our hotel, let the kids get some nice sensory bath time and went to bed, late again for them, early for us. Oh and before dinner, while we waited for the table we went to the top of our hotel to stare up at the empire state building for a few moments. The top is a bar though, so the kids weren’t really supposed to be there. 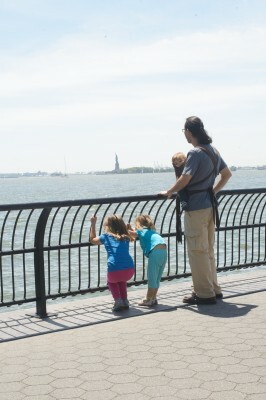 Each of these days Celia kept saying ‘oh I see the statue of liberty!’ when she saw an advertisement or statue for a tourist shop. So we felt like maybe we should give her a clue of what it really was. We knew we weren’t going to really go take the ship and go see it while they’re so young. We’ll bring them back when they’re older and they’d actually understand it and learn something from it. In the morning though we had plans to meet up with my cousin Will who we haven’t seen in a while. We met with him and his wife Sarah for some brunch. After yet more issues with high chairs (here’s the one table that fits your big group, yes we have a high chair, but no that high chair doesn’t fit at that bar height table as we figured out at seating) we had a very yummy and fun brunch together. 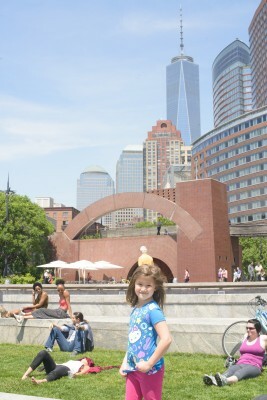 After brunch we headed south to the very tip of Manhatten to get a glimpse of the statue of liberty. 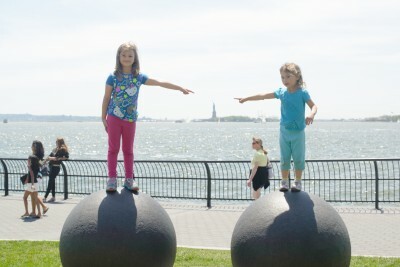 Again the kids loved the wide open space to run around in, the gorgeous sunshine and could sort of see the statue. 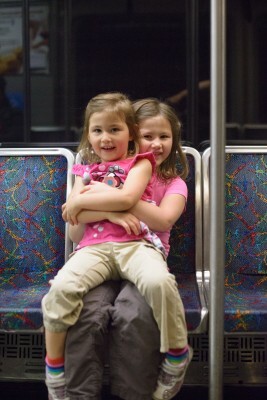 Josie and Celia even unprompted came together for a hug. After some good run around time, we headed back north to Chinatown on the subway for some treats. The girls had some super cute cakes and we tried a sponge cake too. We also looked around for some dumplings before heading further uptown to Penn station for our ride home. The train was delayed, but we picked up snacks, tooled around a little before catching our train back home. We got in late, but it worked out with more eating, a bit more sleeping, and lots of bathroom trips again. What’s always fun is watching the girls play out what we did on our trip when we got home. The girls had fun playing train and lugging around bags pretending to travel in the city, complete with requiring lots of hand holding and stroller holding! At the end of May we took a family trip down to NYC, just for fun. Because traveling with three small children to one of the biggest cities in the world is fun right? Right. Well, we thought it would be. 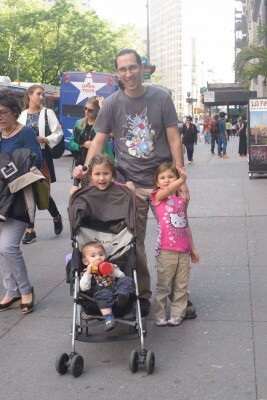 We used to regularly visit NYC and we took Josie a few times but Celia had never been (except in utero) and certainly not Ewan. So off we went. We decided to take the train, because Jordi and I are not fans of driving long distances, nor are our kids. The train lets us all move around more, eat, drink, pee whenever and I think even though we don’t spring for the express train we still get there faster than driving would be because we’d have to stop, probably more than once. Above is us before we got on the bus, to take the subway to get to the train. Doesn’t Josie look thrilled. But we got out the door on time, with one carry-on suitcase, one hiking backpack and one regular backpack to carry all our stuff. We packed strategically and didn’t even need the extra clothes. 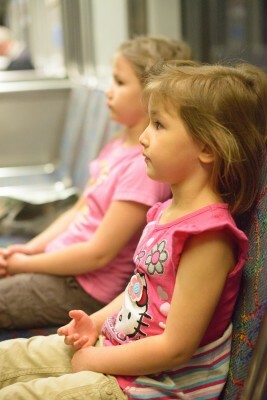 I’d love to say the girls sat and behaved peacefully like the picture below. But it was more like this one and then descending into more wiggles and trouble sitting still. Ewan was in the stroller wanting to get out and walk around on the subway. We already learned our lesson with that one and his request for walking on a moving subway was denied. Sitting down is not his favorite. We made it to south station, bought all kinds of food for lunch, snacks and dessert and waited for them to call our train. We board our train, make it through the four hours of mostly staying in our seats with many many trips to the bathroom and a few walks. Ewan eventually takes a very late nap. We get to Penn station, find our way out of that maze with luggage, and walk over to our hotel and check in. 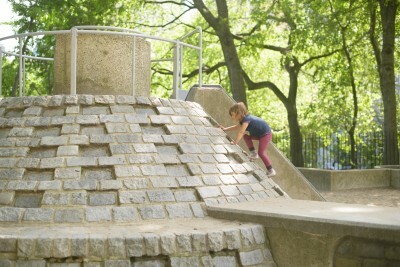 Then we head south to the nearest green space we can find for the kids to run off some energy, Madison square park. Notice we’re all still wearing the same clothes! yay! no vomiting! This would be the picture right before the vomiting. Turns out many hours on a train plus a very well oiled tire swing will do Josie in. I stop her from the swing, and get Celia and the other kid off, and then Josie stands up and pukes on the tire. I get Josie out and try to start cleaning up. Celia has the biggest freak out I’ve ever seen her have in her entire life. So I have one kid sitting on the ground, puking again a bit, and another girl screaming ‘NO NO NO I DONT WANT TO GO HOME. SHES NOT ALLOWED TO BE SICK.’ or something to that effect. Ewan see’s Celia upset and decides that the fit has hit the shan, and starts crying too. I’m trying to keep other kids from climbing onto the puked on swing. Some other mom is offering Josie a half drunk water bottle, which I’m not so comfortable with and get Josie her own water. Celia is still screaming from across the park. I manage to clean up the puke, the swing, and shuffle Josie off to the side with the other screaming crying kids with Jordi and proceed to comfort them sequentially. Yeah, so, good times there. Eventually everyone calms down. I had previously been trying to get a dinner recommendation from people at the park, but it seems no one actually lives in the city. Everyone I asked said they didn’t. Eventually one person said ‘go to Eatily‘, so we did. We found the pasta/pizza part of the store and put our name in and even though Celia and Josie were just barely hanging on for being slightly acceptable in public, we resolved to push through, because we had no idea what else to do. Once we finally got seated and the food, they perked up. Pasta and pizza make everyone’s day better, especially covered in copious amounts of butter and cheese. We headed home for the night and tried to get as much sleep as we could, late for the kids, but early for us grown ups! You are currently browsing the JenJordi.org weblog archives for June, 2014.